Hotel Giridhar is a well maintained budget hotel in Haridwar. The hotel is in proximity of Jwalapur Railway station. Haridwar is a holy city and taking dip on holy river Ganges at Haridwar has a religious importance. The Prem Nagar Ghat and Govind Ghat are located closer to the hotel. Maa Mansa Devi and Maa Chandi Devi temple are some special attractions of Haridwar which lies in the vicinity of Hotel. Enjoy a comfortable stay in Deluxe and Executive class rooms with all modern amenities like Wi-Fi, Cable Tv etc at affordable prices. No need to go outside for meals as there is a well decor restaurant in the hotel. 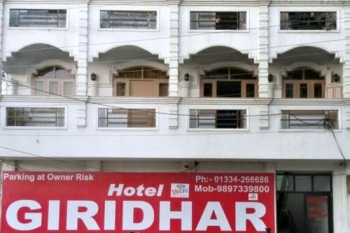 Hotel Giridhar is located near Ranipur Mor in Haridwar, at a distance of 1.5 Kms from Raliway Station and Bus Stand. Famous Har Ki Pauri is only at a distance of 3.5 Kms from the Hotel. 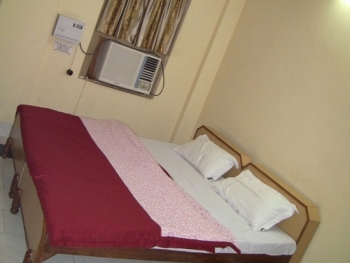 The hotel has a total number of 19 rooms in the category of Standard AC and Standard Non AC rooms with modern aminities like TV, Wi-Fi, Telephone etc. No need to go outside for Breakfast, Lunch or Dinner as the Hotel has an In House Restaurant, that serves you delecious mouth watering meals. You will feel the taste of home made food in the restaurant. - AC, Dish TV, Free Wi-Fi, Attached Toilets/ Bathrooms, Hot & cold running water, 24X7 Power backup. - Daily Housekeeping, Intercom dialing, Laundry service. Sight seeing facility to Premnagar Ashram, Daksh Prajapati Temple, Har Ki Pauri, Mansa Devi Temple, Chandi Devi Temple, Shanti Kunj Haridwar, Jain Temple, Pawan Dham Temple, Vaishno Devi Temple, Bharat Mata mandir, Patanjili Yogpeeth, Laxman Jhula and Ram Jhula in Rishikesh, Mall Road Mussoorie, The Pentagon Mall Haridwar with Waves Cinemas, Fun Valley Amusement park and many other places. You can travel to Haridwar by Air, Train or Road. By Air: The nearest domestic Airport to Haridwar is at a distance of 35 Kms in Jolly Grant Dehardun. Daily Flights are avilable for Dehradun from Delhi. So you can board a flight for Dehradun and cover the remaining distance by Taxi. By Train: Haridwar Railway Station is well connected by Trains to many parts of India. Some important trains to Haridwar are Shatabdi Express from New Delhi, Amritsar Express from Amritsar, Hemkunt Express from Jammu, Sangam Express from Allahabad, Upasana Express from Howra, Bandra Expredd from Mumbai etc. By Road: Motorable roads connects Haridwar to many destinations of Northern India, so direct buses are avilable for Haridwar from these places. You can board direct buses to Haridwar from Delhi, Rishikesh, Dehradun, Haldwani, Shimla, Ludhiana, Chandigarh, Amritsar and many other places.